In the Moody for Delicious Food! It’s time for the most wonderful season of all. The season of food! Get ready because Moody Gardens has you covered this holiday season with an assortment of scrumptious offerings you and your family can enjoy. Enjoy holiday attractions like the Festival of Lights and grab a turkey leg or even some kettle corn. There are plenty of snack stands and kiosks on property to get your sweet and savory food fix. Here’s a snapshot of what food offerings you will see on property this holiday season: Hot Chocolate, Funnel Cakes, Jumbo Pretzels, Turkey Legs, Sweet Crepes, Jumbo Hot Dogs, Cinnamon & Sugar Mini Donuts, Dippin’ Dots, Buttered Popcorn, Cheetos Popcorn, Kettle Korn, Pork Skins, Corn in a Cup, Potato on a Stick, Chicken Bites, Tamales, Holiday Cookies, Nachos, Texas Size Sausage on a Stick and Foot Long Corn Dogs. 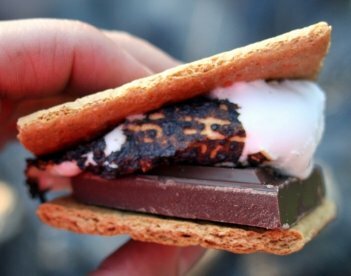 Roasted s’mores are also a nice fireside snack. Visit one of our open firepits and make a smore that will go towards conservation efforts. The money that is raised goes to the Galveston Chapter of the American Association of Zoo Keepers – Last year over $7000 was donated to them! Proceeds will benefit the Galveston Chapter of the American Association of Zookeeper’s conservation projects to help the Saola Working Group and Turtle Island Restoration Network. Take in a buffet while you are here. Enjoy the Garden Restaurant’s Festival of Lights buffet from now until January 6. Click here for the menu. The Garden Restaurant will also be open for Christmas Day. Click here for menu. 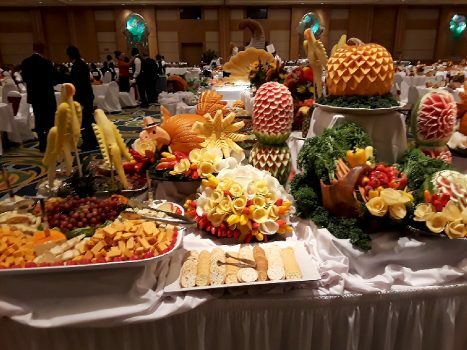 The Moody Gardens Hotel also has some delectable buffet offerings this holiday season. At Café in the Park enjoy a special holiday dinner buffet from December 22-January 6. Buffet menu is available here. A Christmas Day Brunch will also we be available from 11:30am-2:00pm on December 25. Click here for Christmas Day Brunch menu. Shearn’s Seafood and Prime Steaks located on the ninth floor of the hotel is pleased to offer holiday features in addition to its award winning dinner menu. Dressy casual attire required. For more information on Shearn’s please click here. Don’t miss Cirque Joyeux Dinner and Show! From December 21-January 4 enjoy a spectacular, exhilarating and joyous celebration of the Christmas season live on stage featuring acrobats, aerialists, clowns and more all paired with a dinner buffet prepared by the Moody Gardens Hotel Executive Chef. It’s all happening at the Moody Gardens Convention Center. For more information please click here. You and your family can have breakfast with Santa while you are here! Open to Moody Gardens’ members and non-members on a first-come, first-served basis. Enjoy a Meet and Greet with Santa and Friends along with a delightful breakfast! A souvenir photo is also included. Cost is $30 for adults and $18 per child. Moody Gardens’ Member cost is $25 for adults and $15 per child. Breakfast with Santa will be available December 1, 8 and 15 at 9:00am or 10:30am in the Garden Restaurant. To see what will be on the menu please click here. The holiday season is here at last which means delightful and bountiful eats are not too far. Enjoy all that Moody Gardens has to offer this holiday season and enjoy some great food as well. For more information on this season’s eatings please click here. Previous Previous post: The Birds of Moody Gardens – A lot to be Thankful for!